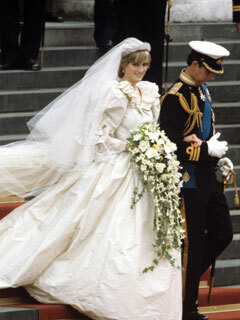 With the royal wedding a mere hours away and with millions of women dying to see what Kate will wear, I thought I’d take us on a little tour of bridal fashion from the last 100 years. 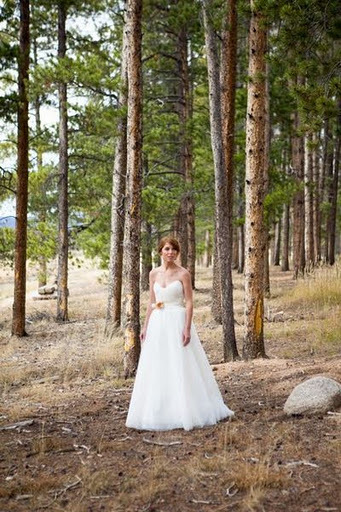 I included only photos of real brides; no runway pictures here. 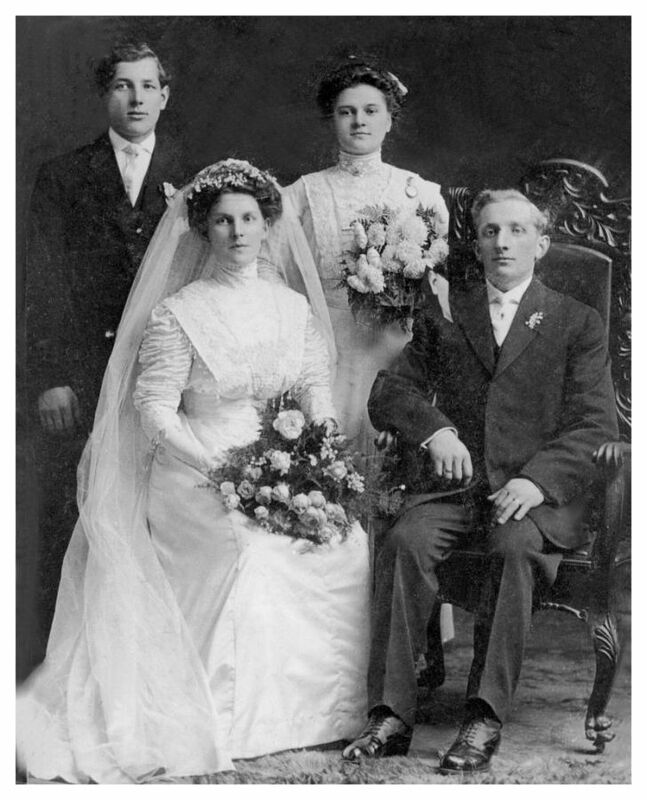 Bride, groom, and attendants from 1910, photo from here. High buttoned-up neckline and no smiles. I bet this wedding was tons of fun. 1920s bride, photo from here. Flapper style has always been one of my favorites. I also love how she is pointing her toe in front like a ballerina. 1930s bride and groom, photo from here. Depression era weddings called for a simpler look, but they still found a way to show their style with the headwear. 1940’s bride and groom, photo from here. Hollywood glam, yes please! The calla lilly bouquet compliments her dress perfectly. My maternal grandmother and grandfather on their wedding day in 1955. I wish this dress was still around because I adore it. The 50s were all about the tea length dresses with some extra volume in the skirts. And that bolero jacket? Perfection. 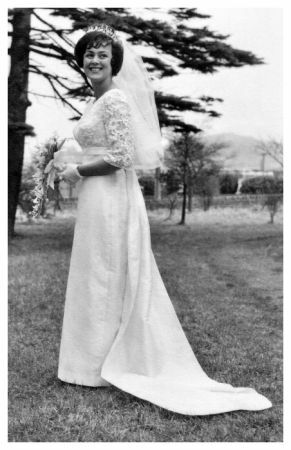 1960s bride, photo from here. Super sweet details with a streamlined sillouette. She looks so happy! 1970s bride, photo from here. Check out the caption with the cost of the wedding! Gotta love those sleeves. The quintessential 1980s bride, Princess Diana with her Prince charming uhh… well, you know. Photo from here. Her train was 25 feet long. Holy cow. I had a dream the night I got engaged that I was suffocating in a dress just like this. I woke up covered in hives!! That’s a story for the grandkids. 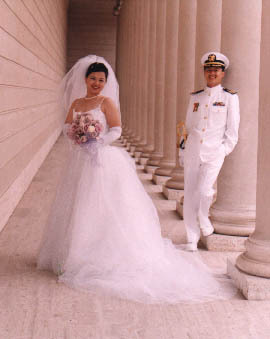 1990’s bride and groom, photo from here. Spaghetti straps and long gloves – oh the 90s, how I loathe you. ﻿Mrs. Cowboy Boot in 2009, from my favorite wedding on Weddingbee. 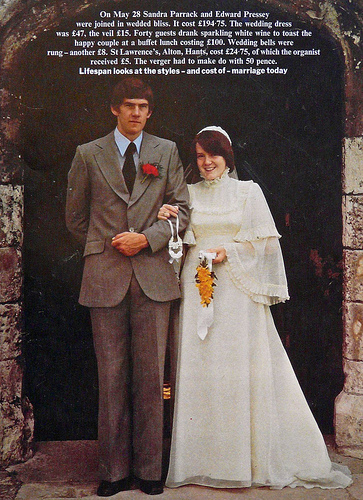 ﻿The early part of the 21st century was all about the strapless wedding dress. Belts were also big and usually had either flowers or rinestones. The dress above originally came with little cap sleeve (which I loved – so jealous of this dress), but she had them removed because strapless was is so IN. I have a feeling that the dress that Kate wears tomorrow will set the trends for the next 10 years of bridal fashion, and beyond. My prediciton? Long sleeves, clean lines, elegant, but playful, and absolutely georgous. I can’t wait!! Love this post – I'm so excited for the wedding! I'm guessing she does two dresses, one for the ceremony and one for the reception. Loved this journey through time! So curious to see what dress shape defines the next decade!